An investigation into the various modes of transporting cargo nationally and internationally. All businesses that deal in goods sold anywhere other than the place they’re produced need cargo transported, whether it’s to ship their goods to the other side of the world or only to the other side of town. Here we consider different ways of transporting goods, along with when they’re suitable and the advantages they can offer. Most often used in the central business districts of metropolitan cities, bicycle messengers are one of the simplest and most effective methods for close-range deliveries of documents and lightweight packages. Over short distances, especially in congested city centers, bicycle deliveries may even be faster than deliveries by car or truck. This is because bicycle couriers can weave in and out of traffic. Of course, bicycles also don’t need petrol, so you avoid fuel costs. In terms of energy consumed per kilogram or ton of cargo, rail freight is one of the most efficient forms of transportation. It’s often the cheapest option for bulk shipments of commodities that require little to no packaging, such as grain or coal. The downside is that rail freight is less flexible than road freight. 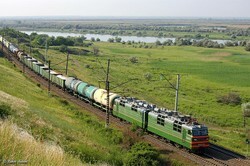 Delivery times depend on fixed departure times and freight can be delivered only to fixed stations. A high percentage of freight that was once couriered by rail is now hauled by truck instead. Virtually any size and type of cargo may be transported by ship, whether on the sea or by river. Especially for large shipments between continents, sea freight remains the cheapest option. However, transport by sea takes longer than other methods and so isn’t appropriate for highly time-sensitive cargoes. Specific types of ships have been designed to carry particular types of cargoes. Bulk carriers are best for shipping rice, grain and other bulk cargo, container ships carry just about any type of cargo that can be safely packed in containers, tankers carry fluids such as oil or petroleum products and refrigerated ships are equipped to transport fruit, vegetables, meat, fish and dairy products. Air freight services are a vital component in many companies’ logistics operations. It allows fast, dependable deliveries over long distances, making it possible to determine accurate delivery times. It also makes it easy to trace goods included in international shipments. Air cargo may be transported using civil passenger or dedicated cargo airlines, or even by private plane. Often air freight planes are specially designed to allow easy loading. For example, this type of plane often has large doors. In some cases, the entire nose of the plane flips up to reveal the cargo area. Multimodal freight – also known as intermodal freight – involves using more than one mode of transport to complete a shipment. For example, goods may be transported to a dock area by rail, over sea by a container ship and then by road to a warehouse. Multimodal freight options are often offered by logistics specialists and typically reduce costs and improve security. Cargo handling between the different modes of transport is reduced and security is improved because the cargo is all containerized. Also, the ideal form of transport can be chosen for every stage of the delivery, based on the nature of the cargo and your needs in terms of delivery times and budget.